Membership in the Boston Terrier Club of America is granted to those individuals who agree to the Constitution and By-Laws of the BTCA. The central core of these documents is the promise that each member will not sell puppies or adult dogs to pet stores and/or in littler lots. It is the expressed concern that members be aware of the existance of "puppy mills" and un-ethical persons who would do our breed harm. To become a member of the Boston Terrier Club of America, you must be sponsored by two BTCA members in good standing and then be voted in by the Board of Directors. 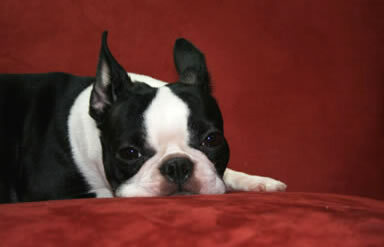 You must agree to be responsible Boston Terrier owners and breeders. If you are interested in becoming a BTCA member please print and fill out our "Membership Form". Follow the instructions for submission that appear on the form. This form is in .pdf format...just use your browser's print function. You will need to have Adobe Acrobate Reader loaded on your computer. Most newer computers come with this already installed. If you do not have this program you may download it for free by following the link below. Have two BTCA members in good standing sign the forms along with your signature and return them to the address listed. If you can not print out these forms, or have any questions regarding membership, please contact our Corresponding Secretary and a Membership Application will be forwarded to you in the mail. PLEASE NOTE: Per Article I, Section 3 of The BTCA Bylaws, no new member application can be considered from February 1 - the Annual Meeting of the Membership, held in conjunction with the BTCA National Specialty each year in April or May. Any new member applications received too late to be considered by January 31 will be held by the Corresponding Secretary until after the Annual Meeting that year. and to pay for a website link listing.